In the mid 1930's Samuel South(2) 1876-1956 purchased 20 hp Long Twenty Armstong Siddeley limousine, registration no. EMF 42. It was an impressive vehicle and many family members will recall special journeys in the car. An advertisement and review of the period are reproduced below followed by a review from "The Motor". On the long wheelbase 20 h.p. 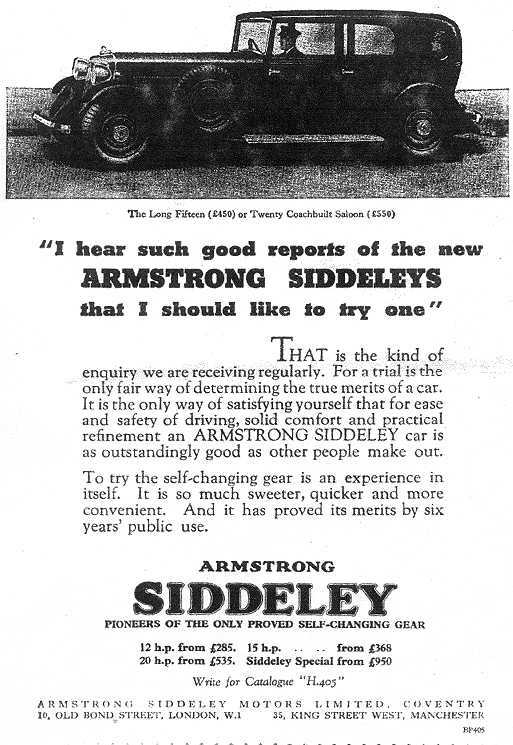 Armstrong Siddeley chassis, which is 10ft. 11 ½ in. against 10 ft. 2 ½ in. for the normal chassis, there is now available an improved style of the of the enclosed limousine chauffeur-driven style of body for which the long body is intended. This is a remarkably good production, for not only is it very roomy indeed in the all important rear compartment without the car being of unwieldy bulk, but also the detail work is extremely well done. The upholstery of the rear compartment of an example which was inspected was done in a very pleasing brown cloth with a wide folding centre arm-rest. There is all the leg and head room that can be desired - an important point is that there is an adjustment permitting the back seat cushion to be moved forwards and forwards by means of a convenient handle control, and thus give an alteration in angle of the squab from a practically vertical position to one affording a reclining effect if required. Two occasional seats are normally folded back against the partition, and, when raised still leave good leg room for the passengers on the main seat. The occasional seats themselves are wide and set close together, so that, if necessary, three people could occupy them. The partition has sliding windows, the side windows are deep, so as to give light and a sense of space inside the car, but are not so high to detract from the appearance, and there is evidence where-ever one looks to remarkable attention to detail features and finish. There is a skin rug on the floor and beneath this are concealed foot-rest ramps. The instrument board is very well done, with a circular type of dial, the burr walnut interior woodwork is tasteful, whilst the door fittings are very neat and do not project in the way that is common. The driving seat is upholstered in leather and also ahs a folding arm rest, whilst vision is notably good, the screen pillar being thin. The price of this limousine is £745. Permanently fitted four wheel jacks are included in the chassis equipment. There is luggage accommodation by means of a platform which, when out of use, folds flush into the rear panel of the body. One of these cars has lately been supplied to Lord Greenwood by Warwick Wright Ltd., New Bond Street, W.1, who are London distributors of Armstrong Siddeley cars.